Helps the body maintain a healthy acid-base balance. Reduces acid concentrations in tissue and body fluids with the result that intra-cellular nutrient transportation may be improved. The absorbed alkaline materials of Power pH with Bio-pH can moderate the cycle of chronic inflammation induced by over acidity of tissue. Raises pH levels (reduces acidity levels) of body fluids, including urine and blood. Supports healthy liver and kidney function. Promotes faster recovery from vigorous workouts by decreasing the amount of muscle damage and soreness created by vigorous exercise due to the build-up of acids in the muscle. aids the body in the removal of acidic waste from cells. Improves performance during workouts by neutralizing acids generated internally by sustained physical activity (or “exercise-induced metabolic acidosis”). Alkalizes the acids generated internally by high-protein diet (or “diet-induced metabolic acidosis”). 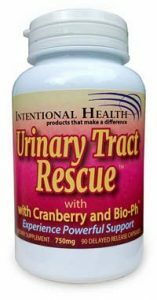 People used to think that cranberry worked for urinary tract infections by making the urine acidic and, therefore, unlikely to support the growth of bacteria. NIH-funded researchers, among others, don’t believe this explanation any more. They now think that some of the chemicals in cranberries keep bacteria from sticking to the acid-irritated cells that line the urinary tract where they can multiply. 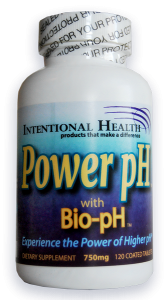 Bio-pH reduces the acidity levels of body fluids, including urine, making infection less likely. At the same time, Bio-pH may improve the intra-cellular nutrient transportation of the cranberry phytonutrients to improve bio-availability. 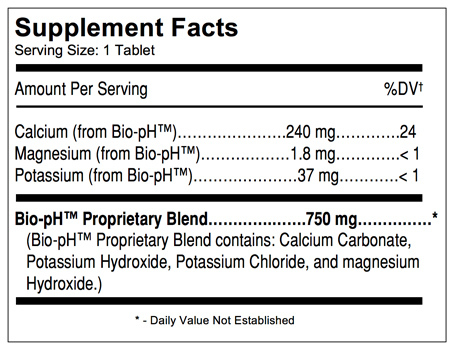 Suggested Use: 3 tablets daily with water. 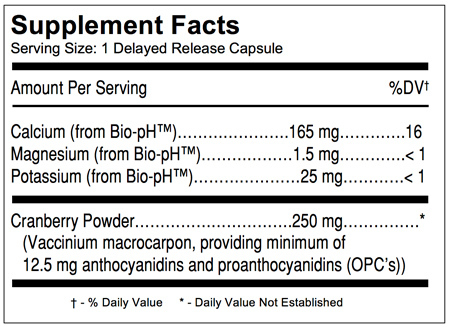 Other Ingredients: Vegetarian Capsule (DRCaps™), Cellulose, Magnesium Stearate, and Silica. Bio-pH™ is a registered trademark of Intentional Health, Inc., Issaquah, WA. DRCaps™ is a registered trademark of Capsugel Belgium NV, Belgium.